New York City is ever changing. Street names are changed to honor heroes, Old tenement housing is replaced by eye-catching glass & steel towers, and then you have the High Line...an abandoned elevated train track converted into miles of gorgeous park land. There's nothing more peaceful and pleasant than finding a quiet space among trees and flowers tucked away in the middle of the bustling city. But the High Line is more than that, it's a brilliant example of how to transform something that's outlived its usefulness and is being wasted, into something that adds joy to the lives of those around it. 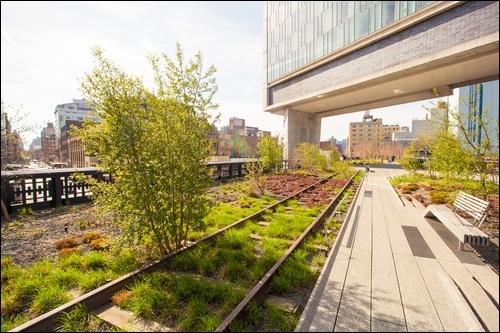 Enjoy Nature - The High Line is beautiful, and can be enjoyed in the spring, summer, fall and even the winter if you wear layers of warm clothes. You can take a 1.45-mile (2.33 km) stroll and enjoy the flowers, bushes, trees and wild grasses that adorn the paths and walkways, or relax on a bench and take in the serene surroundings. Enjoy Good Food - All during the spring and summer months you'll find fantastic food carts that offer an ecletic mix of foods, and the Santina Italian Restaurant (at the southernmost entrance to the High Line, at Gansevoort and Washington) & Terroir at The Porch (at 15th Street at 10th Avenue) are open year round. Take Tour - You can take a free hour long guided tour of the High Line with one of the many knowledgeable Docents. If you have a large group, you can arrange for a private tour. 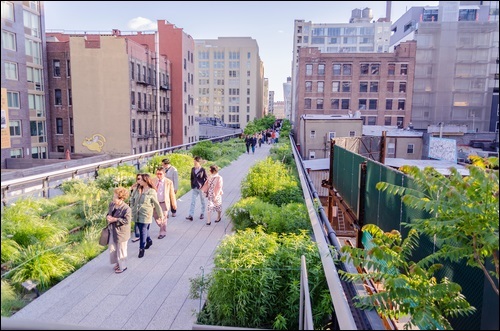 Learn about the plant life, the sustainability efforts taking place a the High Line and its incredible history. Special Events - There's always plenty to see and do at the High Line. There are art shows, free concerts, holiday toy drives and so much more. Take a look at the event calendar and find out what's happening. from Gansevoort Street to 34th Street. L, A, C or E trains to 14th Street & 8th Avenue. Take the M11 or M14 to 9th Ave or the M23 or M34 Bus to 10th Ave. The High Line gets about five million visitors a year. Its a very popular place! The High Line was created in three phases. Construction started in 2006 and was completed in September of 2014. Phase One and Two cost $152 million. The final phase came in at around $45 million. The High Line is a public park owned by the City of New York, however the Friends of the High Line raises 98% of the High Line's annual budget. The park is also maintained and operated by the Friends of the High Line in conjunction with the Parks Department.